This article is about the geopolitical entity created in Mesopotamia (Iraq) under British administration. For the proposed Mandate instrument over the area, see British Mandate for Mesopotamia (legal instrument). Three important anticolonial secret societies had been formed in Iraq during 1918 and 1919. The League of the Islamic Awakening (Jam'iyya an-naḥda al-islāmiyya) was organized at Najaf. The Muslim National League (al-Jam'iyya al-waṭaniyya al-islāmiyya) was formed with the object of organizing and mobilizing the population for major resistance. In February 1919, in Baghdad, a coalition of Shia merchants, Sunni teachers, and civil servants, Sunni and Shia ulama, and Iraqi officers formed the Guardians of Independence (Harās al-istiqlāl). The Istiqlal had member groups in Karbala, Najaf, Kut, and Hillah. The Grand Mujtahid of Karbala, Imam Shirazi, and his son, Mirza Muhammad Riza, began to organize the insurgent effort. Shirazi then issued a fatwa (religious ruling), pointing out that it was against Islamic law for Muslims to countenance being ruled by non-Muslims, and he called for a jihad against the British. By July 1920, Mosul was in rebellion against British rule, and the insurrection moved south down the Euphrates River valley. The southern tribes, who cherished their long-held political autonomy, needed little inducement to join in the fray. They did not cooperate in an organized effort against the British, however, which limited the effect of the revolt. The country was in a state of anarchy for three months; the British restored order only with reinforcements from India. The Iraqi revolt against the British of 1920 was a watershed event in contemporary Iraqi history. For the first time, Sunnis and Shias, tribes and cities, were brought together in a common effort. In the opinion of Hanna Batatu, author of a seminal work on Iraq, the building of a nation-state in Iraq depended upon two major factors: the integration of Shias and Sunnis into the new body politic and the successful resolution of the age-old conflicts between the tribes and the riverine cities and among the tribes themselves over the food-producing flatlands of the Tigris and the Euphrates. The 1920 rebellion brought these groups together, if only briefly; this constituted an important first step in the long and arduous process of forging a nation-state out of Iraq's conflict-ridden social structure. On 1 October 1922, the Royal Air Force in Iraq was reorganized as RAF Iraq Command, and given control of all British forces in the kingdom. In order to impose the Hashemite monarchy on the people of Mesopotamia the British used violence, causing 98,000 casualties, gassing and bombing the local resistance into submission. During the 1920s and 1930s, the monarchy was engaged with the British in fighting one revolt after another. The conservative and anti-nationalist British historian Elie Kedourie records that "the North as a whole had to be coerced by the Royal Air Force." When the Kurdish leader Sheikh Mahmud led another rebellion, the British used the newly established Iraqi army to quel the revolt, but that was ineffective. The British then resorted to the RAF. In the same period, rebellions by the Shia in the South had to be suppressed. At the Cairo Conference of March 1921, the British set the parameters for Iraqi political life that were to continue until the 1958 revolution; they chose a Hashemite, Faisal ibn Husayn, son of Sherif Hussein ibn Ali former Sharif of Mecca as Iraq's first King; they established an Iraqi army (but kept Assyrian Levies under direct British command); and they proposed a new treaty. To confirm Faisal as Iraq's first monarch, a one-question plebiscite was carefully arranged that had a return of 96 percent in his favor. The British saw in Faisal a leader who possessed sufficient nationalist and Islamic credentials to have broad appeal, but who also was vulnerable enough to remain dependent on their support. Faisal traced his descent from the family of the Prophet Muhammad. His ancestors held political authority in the holy cities of Mecca and Medina since the 10th century. The British believed these credentials would satisfy traditional Arab standards of political legitimacy; moreover, the British thought Faisal would be accepted by the growing Iraqi nationalist movement because of his role in the 1916 Arab Revolt against the Turks, his achievements as a leader of the Iraq emancipation movement, and his general leadership qualities. Faisal was instated as the Monarch of Iraq after the Naquib of Baghdad was disqualified as being too old (80 yrs) and Sayid Talib (a prominent Iraqi from the province of Basra) was deported on trumped up charges by the British. The voting was far from a reflection of the true feelings of the Iraqi people. Nevertheless, Faisal was considered the most effective choice for the throne by the British government. The final major decision taken at the Cairo Conference related to the new Anglo-Iraqi Treaty of 1922. Faisal was under pressure from the nationalists and the anti-British mujtahids of Najaf and Karbala to limit both British influence in Iraq and the duration of the treaty. Recognizing that the monarchy depended on British support— and wishing to avoid a repetition of his experience in Syria — Faisal maintained a moderate approach in dealing with the UK. The treaty, which had been originally set as a 20-year engagement but later reduced to four years, was ratified in June 1924; it stated that the king would heed British advice on all matters affecting British interests and on fiscal policy as long as Iraq had a balance of payments deficit with the UK, and that British officials would be appointed to specified posts in 18 departments to act as advisers and inspectors. A subsequent financial agreement, which significantly increased the financial burden on Iraq, required Iraq to pay half the cost of supporting British resident officials, among other expenses. British obligations under the new treaty included providing various kinds of aid, notably military assistance, and proposing Iraq for membership in the League of Nations at the earliest moment. In effect, the treaty ensured that Iraq would remain politically and economically dependent on the UK. While unable to prevent the treaty, Faisal clearly felt that the British had gone back on their promises to him. The British decision at the Cairo Conference to establish an indigenous Iraqi army was significant. In Iraq, as in most of the developing world, the military establishment has been the best organized institution in an otherwise weak political system. Thus, while Iraq's body politic crumbled under immense political and economic pressure throughout the monarchic period, the military gained increasing power and influence; moreover, because the officers in the new army were by necessity Sunnis who had served under the Ottomans, while the lower ranks were predominantly filled by Shia tribal elements, Sunni dominance in the military was preserved. The new Anglo-Iraqi Treaty was signed in June 1930. It provided for a "close alliance," for "full and frank consultations between the two countries in all matters of foreign policy," and for mutual assistance in case of war. Iraq granted the British the use of air bases near Basra and at Al Habbaniyah and the right to move troops across the country. The treaty, of twenty-five years' duration, was to come into force upon Iraq's admission to the League of Nations. With the signing of the 1930 Treaty and the settling of the Mosul Question, Iraqi politics took on a new dynamic. The emerging class of Sunni and Shia landowning tribal sheikhs vied for positions of power with wealthy and prestigious urban-based Sunni families and with Ottoman-trained army officers and bureaucrats. Because Iraq's newly established political institutions were the creation of a foreign power, and because the concept of democratic government had no precedent in Iraqi history, the politicians in Baghdad lacked legitimacy and never developed deeply rooted constituencies. Thus, despite a constitution and an elected assembly, Iraqi politics was more a shifting alliance of important personalities and cliques than a democracy in the Western sense. The absence of broadly based political institutions inhibited the early nationalist movement's ability to make deep inroads into Iraq's diverse social structure. The Mandatory administration continued to operate until 1932. In 1936 and 1937 protests and revolts broke out. The main issues centered around agarian issues and military conscription. Kedourie states that the British crushed protests against military conscription with the use of machine-gunning and bombing from the air. The "killing, it seems, was indiscriminate, and old men, women and children were the victims." When in 1937 a revolt against agrarian and conscription issues broke out, it was also ‘put down with the help of indiscriminate aerial bombing’. and Shia religious leaders were expelled because they were Persians. The monarchy also introudced public. Kedourie describes the monarchy as despotic, with a record "full of bloodshed, treason and rapine" and "however pitiful its end we may know that it was implicit in its beginning." The British mandate and the institutions it gave rise to in Iraq, were the agents of a modernisation that did not arise gradually or indigenously as the outcome of a population’s own resourcefulness and engagement with the world. The British in Iraq were modernisers more than colonisers, despite acting out of self-interest. When we consider the long experience of Britain in the government of Eastern countries, and set beside it the miserable polity which she bestowed on the populations of Mesopotamia, we are seized with rue- ful wonder. It is as though India and Egypt had never existed, as though Lord Cornwallis, Munro and Metcalf, John and Henry Lawrence, Milner and Cromer had attempted in vain to bring order, justice and security to the East, as though Burke and Macaulay, Bentham and James Mill had never addressed their intelligence to the problems and prospects of oriental government. We can never cease to marvel how, in the end, all this was discarded...[in] Mesopotamia. If Makiya is referring to economic development in his account of the British modernising legacy in Iraq, an authoritative study demonstartes that Iraq’s productivity in agriculture, the most important sector at the time, in fact declined from 275 kg per acre in 1920 to an average of 238 kg per acre between 1953 and 1958. Under the British mandate a new ruling class of 'government shaikhs' was created. "Many of them [the Shaikhs], reported Major Pulley to the British commissioner in Baghdad in 1920, "were small men of no account until we made them powerful and rich." The Civil Commissioner Wilson reported on his part that the Shaikhs "were in most cases directly dependent on the civil administration for the positions they held; realising that their positions entailed corresponding obligations, they co-operated actively with the political officers." In a dispatch by a British official to London in 1928, there was a description of how the electoral system worked: the government’s provincial governors were in fact election agents who drew up lists of those to be elected and of those who would do the electing. Elections to "the chamber of deputies and appointments to the senate," comments Keeourie, "were an additional weapon in the hands of the government wherewith the better to control the country." On 3 October 1932, the Hashemite Kingdom of Iraq became a fully sovereign state. 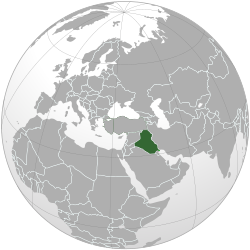 The Iraqi Kingdom under the Hashemites lasted until 1958. Before the collapse of the Ottoman Empire, the British-controlled Turkish Petroleum Company (TPC) had held concessionary rights to the Mosul wilaya (province). Under the 1916 Sykes-Picot Agreement — an agreement in 1916 between Britain and France that delineated future control of the Middle East — the area would have fallen under French influence. In 1919, however, the French relinquished their claims to Mosul under the terms of the Long-Berenger Agreement. The 1919 agreement granted the French a 25 percent share in the TPC as compensation. Beginning in 1923, British and Iraqi negotiators held acrimonious discussions over the new oil concession. The major obstacle was Iraq's insistence on a 20 percent equity participation in the company; this figure had been included in the original TPC concession to the Turks and had been agreed upon at Sanremo for the Iraqis. In the end, despite strong nationalist sentiments against the concession agreement, the Iraqi negotiators acquiesced to it. The League of Nations was soon to vote on the disposition of Mosul, and the Iraqis feared that, without British support, Iraq would lose the area to Turkey. In March 1925, an agreement was concluded that contained none of the Iraqi demands. The TPC, now renamed the Iraq Petroleum Company (IPC), was granted a full and complete concession for a period of seventy-five years. ^ Overseas commands: Iraq, India and the Far East, section "RAF Iraq." In: Air of authority: A history of RAF organization. Retrieved 2015-06-20. ^ a b c Kedourie 1970, p. 438. ^ a b Kedourie 1970, p. 250. ^ Kedourie 1970, p. 237-238. ^ Kedourie 1970, p. 239. Fuccaro, Nelida: The Other Kurds (London: IB Tauris, 1999). Dodge, Toby: Inventing Iraq (2009). Fieldhouse, David K.: Western Imperialism in the Middle East, 1914–1958 (2006). Fisk, Robert: The Great War for Civilisation: The Conquest of the Middle East, (2nd ed. 2006). Jacobsen, Mark: "'Only by the Sword': British Counter‐insurgency in Iraq", in: Small Wars and Insurgencies 2, no. 2 (1991): pp. 323–63. Simons, Geoff: Iraq: From Sumer to Saddam (2nd ed. 1994). Sluglett, Peter: Britain in Iraq: Contriving King and Country, 1914–1932 (2nd ed. 2007). Vinogradov, Amal: "The 1920 Revolt in Iraq Reconsidered: The Role of Tribes in National Politics," International Journal of Middle East Studies 3, no. 2 (1972): pp. 123–39.